but formerly part of the Poltava Province of the Russian Empire. Alternate names Zolotonosha [Ukr, Rus, Yid], Zołotonsza [Pol] Russian/Ukrainian: Золотоноша..
Zolotonosha is presently a raion (1) center of the Cherkassy oblast (2) in Ukraine. It is located on the banks of the Zolotonoshka River, a tributary of the Dnieper, not far from the Dnieper itself. Formed in 1923, the Zolotonosha raion was part of the Kiev and Poltava oblasts from 1932 to 1954. The first written mention of Zolotonosha was in 1576, when this territory belonged to Poland. Its name, meaning a "load of gold" or a "gold carrier", could have originated from the golden glisten of the Zolotonoshka sand, though other legends are known. In the early seventeenth century, Zolotonosha was awarded Magdeburg Rights (3); in 1635 the town got its own coat of arms. In the first half of the century, Zolotonosha was the tax collection hub for the Polish magnate J. Wisniowiecki, the owner of vast Ukrainian territories. 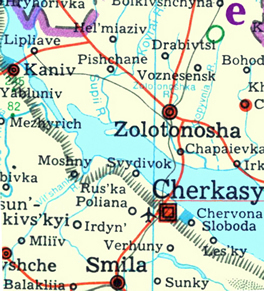 In 1654, Zolotonosha became part of Russia, and was a squadron seat of the Cherkassy and, later, Pereyaslav regimens. Almost one-hundred-thirty years later, in 1781, Zolotonosha again received town status, and was also appointed a center of an uyezd (4) in the Kiev namestnichestvo (5). In 1796-1797, Zolotonosha uyezd was transferred to the Malorossiya guberniya (6) and, after the latter was dissolved in 1802, to the newly formed Poltava Guberniya. According to the middle-eighteenth century laws of Russia, no Jew was allowed to live in the country. Though there is little doubt that Zolotonosha had some Jewish population when it belonged to Poland in the seventeenth century, it is likely that few, if any, Jews resided in Zolotonosha immediately before the Poland partitions and incorporation of the Polish territories into Russia near the end the eighteenth century. The settlement of Jews in the Kiev namestnichestvo, that included Zolotonosha, was officially allowed only in 1794. According to the statistical tables taken from various sources, 134 and 231 Jews (apparently, only males were counted at the time) resided in Zolotonosha in 1799 and 1803, respectively. During each of these years, 55 and 45 of these Jews, respectively, belonged to the merchant estate. For comparison, 82 members of the Jewish merchant estate were registered in the entire Poltava Guberniya in 1803, 54.9% of these merchants living in Zolotonosha. The 1811 census (7) of the taxable male population (revizskie skazki) listed 171 Jewish males in 86 households of the Zolotonosha kahal (8). Most of these families had already been present in Zolotonosha during the previous census of 1806. The Jewish merchant population of Zolotonosha decreased from 51 in 1806 to 12 males in two households in 1811. This decline was probably due to a higher capital threshold (8,000 roubles) introduced in 1807 for admittance to the merchant estate. During the 1835 census (7), nine-hundred-eighty-eight men and women belonging to one-hundred-thirty-seven households were listed as members of the Zolotonosha kahal; the merchant estate included 53 persons in three households. In 1847, the Jewish Zolotonosha community comprised 1,001 persons. In 1862, the Jewish population grew to 1,864 members out of a total Zolotonosha population of 6,902. At that time, Zolotonosha had 843 private wooden houses, two brick buildings, 36 trading posts, an elementary school, five churches, a synagogue, and two prayer houses. In 1881, a steamboat, bought in Belgium, connected Zolotonosha with Cherkassy, a larger town about thirty kilometers away and across the Dnieper. This part of the Dnieper is now covered by the Kremenchug reservoir.. A railroad was extended to Zolotonosha in 1897. The photo studios of Saksonov, Klimovsky, and Braginsky operated in the town at the end of the nineteenth and beginning of the twentieth centuries. The 1897 census found 7,714 Jews in the entire Zolotonosha Uyezd, including 2,769 in the town of Zolotonosha. The total population of Zolotonosha in 1897 was 8,739. Emigration, the pogroms of 1905-1919, destruction during the Civil War, migration to larger cities, migration from the Pale, World War II devastation, and new waves of Jewish emigration resulted in a steep decline in the Jewish population. At present, Zolotonosha has a population of 31,000 including a very small Jewish community. (3) Magdeburg Rights gave a town some degree of self-rule. (7) The 1811 and 1835 census data cited above can be found in the Family History Library (microfilm numbers 2199926 and 2199927, respectively) as can some Zolotonosha vital records starting from 1868; Zolotonosha birth records for four more years can be found in one of the Kiev archives. The primary census data of the Zolotonosha Jewish community for other years and earlier vital records have apparently been lost. The Zolotonosha KehilaLinks ensures that Zolotonosha's Jewish history will be more readily available to genealogists. Richard L. Baum, on behalf of The Ukraine SIG, originally developed this site, now taken over by Gary Pokrassa. We need your collaboration to develop more content for Zolotonosha. If you have information you think is of interest for viewers of this KehilaLink, please contact Gary Pokrassa. Thanks for your help.